JUDE HODGE Real estate is known for its emotional highs and 7 Jude lows. But thanks to 25 years in marketing, Hodge can look at each client’s situation and know instinctively how to provide the most comfortable experience. Always professional, never pushy, she’s all about building relationships and treating people fairly. 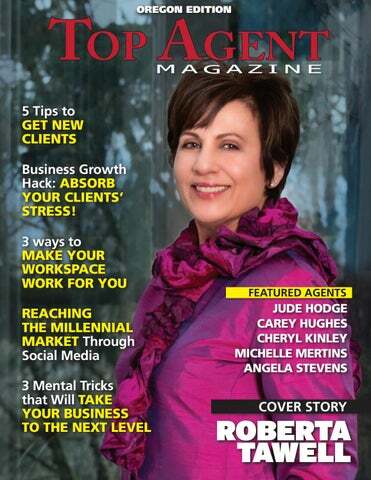 email judehodge@gmail.com or visit her page at facebook.com/judehodgebroker www. 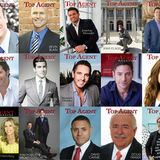 e-mail Ca CareyHu Copyright Top Top Agent Agent Magazine Magazine www. To learn more about ROBERTA TAWELL, visit robertatawell.com, email rmtawell@aol.com or call 503.358-2851 www. JUDE HODGE Real estate is known for its emotional highs and lows. But thanks to 25 years in marketing, Jude Hodge can look at each client’s situation and know instinctively how to provide the most comfortable experience. Always professional, never pushy, she’s all about building relationships and treating people fairly. In real estate, Jude found the career she was meant for. At age 22 she was eager to get her license, but bailed when she saw how difficult the test was. She went into marketing instead, but as time went by, she kept wishing she had done it. Years later, she was doing marketing for five real estate agencies in town and had just posted a condominium on Facebook. A woman in her building expressed interest, and Jude arranged a meeting for her with the agent. The next time Jude saw that agent, she asked what the commission had been on that condo. “It was $23,000,” Jude remembers. “I thought, What am I doing? So at age 53, I got my license.” That was in 2014. The first year, she sold $3.5 million in the first seven months. This year, her fourth, she’s sold close to $20 million. “I waited a lifetime for this, only to find out I was doing the right thing!” she says. “All that networking I did over the years paid off.” Jude serves Brookings and the Oregon coast with a 25 percent repeat and referral rate—remarkable for someone in business just four years, but not surprising, given her level of care. “I always take it beyond the sale,” she says. “If people need a referral to a doctor or mechanic, they know they can call me. I want them to be comfortable in their new surroundings.” She goes a step further, too, hosting dinners with different groups of clients to help them meet others who are also newcomers. “I like to be a catalyst and connect people,” she says. “I want to hold their hands, but not just through the process. I want them to be happy here.” When it comes to marketing her listings, Jude is a strong believer in staging. She goes through the home and offers suggestions, referring to Martha Stewart or the Property Brothers in order not to offend. “Let’s ‘Marthanize’ your home!” she’ll say, meaning buy some pillows, fluff the beds, unclutter the floors. Then she uses 3D Matterport photography, drones and a professional camera to create photos that make the difference between night and day. Jude doesn’t mind spending money to make money. She pays to have her listings on Zillow, Trulia and realtor.com come up on the front page. But among many techniques, her pièce de résistance is a Facebook group, “Brookville,” that she began nine years ago to bring the community together. Today it has almost 17,000 members. She has an additional 38 groups from Las Vegas to Washington, with over a million members. She advertises many of her listings as retirement opportunities on the groups outside the area. Jude and her husband are always working, but they love to go RVing. The ocean, mountains, redwoods and rivers are close by, and with wifi in her car, she never misses a beat in her business. She’s close enough to give clients their keys or show a house, far enough for a therapeutic experience. She credits her company, RE/MAX Coast and Country, for a good deal of her success. “Great support makes a difference in where you go and how you get there,” she says. Jude plans to continue going, and getting there, until she retires. For more information about Jude Hodge of RE/MAX Coast and Country, Brookings, OR, please visit homewithjude.com; call 541-813-9261 or 541-412-9535, ext 117; email judehodge@gmail.com or visit her page at facebook.com/judehodgebroker www. wide-ranging social media efforts, she has developed a proven system to yield optimal online exposure. Efforts in staging, virtual staging, professional photography, drone work, and 3D tours ensure that digital presentations captivate potential buyers and keep inquiries flooding in. When it comes to staying in touch with past clients, Carey makes herself available as a resource and shares valuable information on fluctuations in the market through her social media platforms and by e-mail campaigns. She also takes the time to check in by phone, invites past and present clients to lunch, hosts community events in her neighborhood and throws client appreciation parties and barbeques to demonstrate her gratitude to those she’s served. In reflecting on what she loves most about her career to date, Carey says: “Really, what I love most about what I do is the people—working with them, connecting, and becoming friends. Buying or selling a home can be a stressful process, and it’s so rewarding to be able to give my clients support.” Beyond the office, Carey is involved with her local community through various community events she hosts, in addition to sponsoring the area’s high school and youth sports organizations. When she isn’t busy working, she most enjoys spending time with her family—going to her children’s sporting events, having family barbecues, and enjoying the great outdoors. Travel is also important to Carey, and she’s also enthusiastic about staying active, and enjoys going to the gym and walking her dogs. As for the future of her business, Carey hopes to start an internship program to share her professional insight with young students embarking on their professional lives. With nearly two decades of experience at her back and a genuine investment in her clients’ long-term happiness, the future is bound to hold continued promise for Carey Hughes. he provides her with a multitude of tasks, from digging holes in search of septic tanks to providing personal security and offering valuable business advice. With a burgeoning referral business, Cheryl is clearly doing something right. What that is, she believes, is that “I always put my clients first. My daughter says that sounds corny, but it’s the truth. They do come first, and I think they sense that, they feel that, and they experience that as well. I always answer my phone, return texts and emails. My clients have to know that I’m available to them, otherwise what’s the point?” This care and concern has translated into a solid five-star rating on internet real estate portal Zillow.com. Among the glowing reviews is this solid endorsement: “Cheryl was very helpful with all the details of selling my parents home. She knew the price of homes in the area and was very kind and caring through this difficult time. Cheryl dealt with us on every level about everything happening and I trusted her knowledge and skill. I would recommend Cheryl to help anyone buying or selling a home.” In spite of the financial rewards of the real estate business, it’s the more personal aspects that Cheryl finds most enjoyable. “Because of my family, I really enjoy the flexibility,” she says. “I also love to help people. I believe I’m doing what I’m doing for a reason. When you get involved in real estate it becomes evident that it’s not all about buying and selling, it’s about what’s going on in people’s lives. I believe everything happens for a reason, and this is what I’m doing and I’m very happy and grateful that I get to do it.” Looking to the future, Cheryl plans to continue growing her business, while sacrificing none of the high-quality customer service that has become synonymous with her name. “I love the idea of quality, not quantity…and faith,” she says. For more information about Cheryl Kinley, call 541- 554 - 6476, email oregonwestck@gmail.com, or visit oregonwestrealestate.com www. MICHELLE MERTINS Top Agent Michelle Mertins of Exit Realty Bend in Bend, Oregon has quickly established a reputation as one of the most trusted and dependable real estate agents working in her area today. While relatively new to the industry, Michelle determination and dedication to providing exceptional client service has catapulted her to the top of her profession in record time. A former public servant, she became intrigued by the real estate industry while observing an agent friend of hers. “She was always excited about going to work and helping people,” says Michelle. “I was in a job that wasn’t a great fit for me, and I envied her enthusiasm and the idea of actually enjoying what you do for a living. I had always toyed with the idea of real estate, so I asked her to introduce me to her principal broker. I met him, really liked him, and the decision to begin in real estate was pretty easy.” A resident of the lovely Bend suburb of Three Rivers, Michelle works a large swath of Central Oregon, including Deschutes, Crook, Jefferson, Klamath and Multnomah Counties. Clear, consistent communication during all phases of a transaction plays a huge factor in Michelle’s success, as does follow-up with her clients post-closing table. “I always follow up, and I make it a point to follow up with every single lead that comes to me. I have clients use geo-location to capture leads for texting QR codes and an 800 number, so all of those leads go right to my phone and I immediately follow up with them. I put my homes on realtor tours, so I get realtors through the doors and not just buyers.” Once the sale is complete, Michelle makes a concerted effort to let her clients know how much she appreciates them. Having recently teamed up with a custom greeting card company, she uses that medium to stay in touch. Closing gifts that go above and beyond industry standards are another tool she utilizes, including gift baskets that are customized to the client’s interests. 3 Mental Tricks That Will Take Your Business to the Next Level It’s no secret that running a successful business requires careful planning and a tireless work ethic. Beyond those obvious ideals, it also takes the right mindset in order to capitalize on professional opportunity. In the world of real estate and mortgage lending, mental fortitude is a major component to reaching the next level and achieving longevity in a sector that requires so much self-discipline. With that in mind, we’ve compiled a few key mental tricks you can employ to reinvigorate your working philosophy. Incorporate these techniques into your daily mindfulness routine and your business will surely benefit. Visualization helps you work efficiently and keep your cool. This may sound like one of the oldest tricks in the book, but there’s a reason why Olympic athletes and those serving in first-responder positions use visualization as a time-honored mental technique. Not only does visualizing your daily tasks help you organize your mind, but it amps up your ability to focus on what’s important. Visualization also helps reduce stress in the moment, since you’ve already created a mental expectation of the task ahead. Whether you’re preparing for a negotiation or a pitch to new a client—visualization primes your brain and affords you an extra sense of control as you tackle your day. Distill concepts into their simplest terms for ultimate understanding. ities in clear, definitive terms. Let’s say you have a meeting set with a client to outline a marketing approach for their property. You may understand the broad strokes, but beforehand, try verbalizing the exact takeaways you’d like to impart to your client. This may seem obvious, but one of the best ways to clarify your communication and ensure your complete understanding of a subject is to explain it aloud in its simplest terms. This crystallizes your main point and can come in handy if you drift off-topic or need to double-down on your message. Accept that mistakes will be made. While it’s natural to fear failure, sometimes the dread of making an error can overwhelm your ability to perform. As the saying goes: don’t let the fear of striking out keep you from playing the game. If you accept in advance that set-backs will occur, challenges will come, and things won’t always go accordingly to plan—you’ll be less confounded when hurdles do arise. What matters is keeping an even keel as you sort through unexpected delays or mishaps. Accepting that mistakes will happen allows you to shift your focus towards a solution or contingency plan. In other words, don’t spend your energy trying to achieve perfection. Aim high and work hard, but be in touch with reality: upsets are bound to occur. Accept this and you’ll be ready when they do. The path to lasting success is ongoing, and there are bound to be challenges along the way. It takes mental fortitude to make it to the top, so keep these tricks in mind as you continue to grow as a person and a professional. Seeing situations in a new light can make all the difference as you adapt, evolve, and take your business to the next level. a family team has been a real plus. “If I have a client who absolutely has to see a house immediately and I can’t show it, I always have back-up support,” she says. “My sister and my parents are as emotionally invested in my clients as I am.” Along with her joy in helping people, Angela adores homes. She began her career as a buyer’s agent and has since remodeled and sold homes, which fit right in with her background in art and design. “Aesthetics are important to me,” she says. “I paid attention to what buyers were drawn to. Now I pull that into helping my sellers, making sure their listing looks as aesthetically pleasing as it can.” Add in professional photography, and the listing doesn’t sit long on the market. Since 80 percent of buyers begin their search online, Angela prepares a strong online presence for her listings, including sponsored links on Facebook and Instagram. She does “mega” open houses, door knocking in the neighborhood or sending mailers inviting the neighbors. “It’s hard to beat what we do for exposure,” she says. “We cover every base, including international marketing.” In addition to participating in office charities like KW Cares, three years ago Angela began a women’s networking group as a way of supporting other women’s businesses and fundraisers. She likes supporting clients’ causes, too, such as the fundraiser for foster children that Hatch Homes sponsored this year for a past client. When Angela’s not working, she loves family time, especially taking her two kids “glamping” in the vintage Airstream trailer she and her husband remodeled last year. Passion defines Angela’s future as well as her present. She loves mentoring her team and ultimately wants to become even better at it as she expands her business. This Five Star Professional is sure to enjoy every minute as she moves forward.